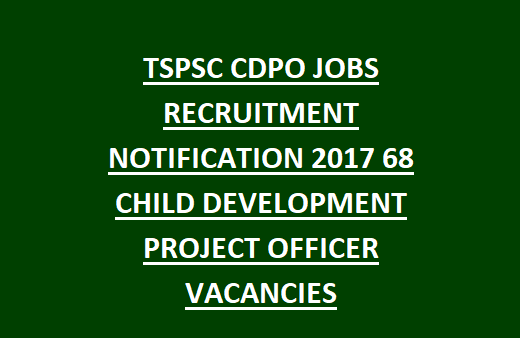 Telangana State, after the Separation of AP Telangana Released the Official Notification for TSPSC CDPO jobs Child Development Project Officer TSPSC Notification 2017 Apply Online 68 Child Development Project Officer TSPSC CDPO Jobs 2017 Telangana State Public Service Commission (TSPSC) has released notification for the TSPSC WDCWD Recruitment 2017 of 68 Child Development Project Officer/ in Women Development and Child Welfare Department in the State of Telangana/ Additional Child Development Project Officer vacancies. TSPSC CDPO Jobs Recruitment 2017 Eligible candidates apply online from 18-09-2017 to 16-10-2017. Candidates Possess Degree in Home Science or Social Work in University in India established on an Institution recognized by the University Grants Commission. Written Examination by Online/ OMR based. TSPC Jobs Applicants required to pay of Rs. 200/- Application fees and Rs.120/- (Examination Fee) online through SBI ePay/ Internet Banking/ Debit Card/ Credit card. No fee for SC, ST, BC, PH, Unemployed applicants in the age group of 18 to 44 years belonging to State of Telangana. Eligible candidates can apply online through the website www.tspsc.gov.in and apply on or before last date the starting and last dates will be 18-09-2017 to 16-10-2017. Go to One time Registration & Fill all the details. Get TSPSC ID & Login with Notification Number, DOB, ID etc. Fill the details and pay fee . For more details like job description, responsibilities, pay scale & other information click on the link given below . For more details like job description, responsibilities, pay scale & other information click on the link given below.